Signed and dated l.l., brown oil "Arthur StrEEton / ... 1895". Julian Ashton., Daily telegraph , ‘National Art Gallery: The Australian Court’, Sydney, 27 Sep 1905, unknown. Herbert Badham, A study of Australian art , 'The first harvest', pg. 61-115, Sydney, 1949, 66. Tim Bonyhady, Images in opposition: Australian landscape painting 1801–1890 , 'Contrasting lights', pg. 135-154, Melbourne, 1985, 150-151. Jane Clark, Golden summers: Heidelberg and beyond , 'Sydney Harbour', pg. 150-152, Melbourne, 1985, 162 (colour illus.). D.H.Souter, Art and architecture: the journal of the Institute of Architects of New South Wales , 'Arthur Streeton, artist and his Australian work', pg. 225-229, Sydney, 1905, 225 (illus. ), 226. Brian Finemore., The arts in Australia: Australian Impressionism , 'Freedom from prejudice: an introduction to the Australian collection in teh National Gallery of Victoria", Melbourne, 1977, 6 (illus.). Mike Gibson, Daily Telegraph , 'Harbour's master of art and soul', pg. 10, Sydney, 11 Oct 1996, 10. Anne Gray, Sydney Long: the spirit of the land , 'The spirit of the land', pg. 45-70, Canberra, 2012, 46 (colour illus. ), 87. David Hansen, Australian book review , 'Bold claims and paradoxes', pg. 12-13, South Australia, Mar 2009, 12. Book review of John McDonald's 'The Art of Australia, vol 1: Exploration to Federation'. Ursula Hoff, Art and Australia , 'Arthur Streeton at Coogee', pg. 386-389, Sydney, Jun 1967, 389. John Huxley, The Sydney Morning Herald , 'Landscaped crusaders', pg. 4-5, Sydney, 09 Jan 2012, 5 (colour illus.). John McDonald, The Sydney Morning Herald , 'In a new light', pg. 13, Sydney, 19 Oct 1996, 13. William Moore, The Courier Mail , 'Art and artists', pg. 24, Brisbane, 09 Jun 1928. William Moore, The story of Australian art from the earliest known art of the continent to the art of today (Vol. 1) , 'Australian school of landscape painters', pg. 85-121, Sydney, 1934, 96, 169, 189. 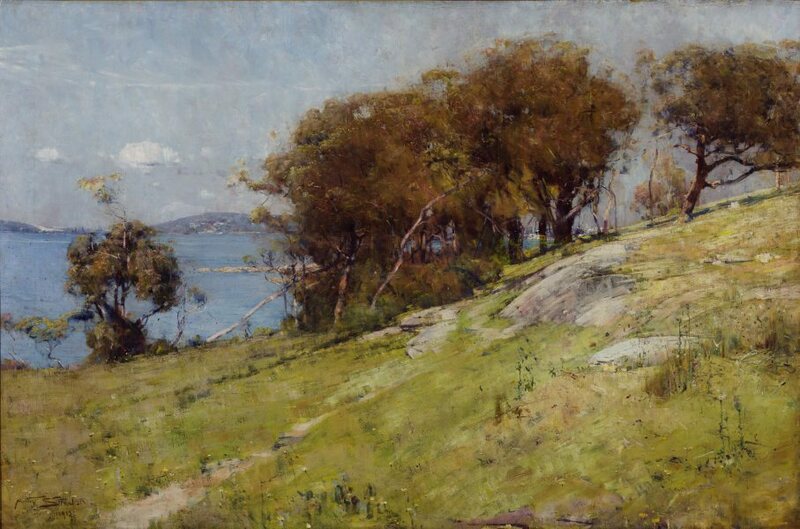 David Thomas, Deutscher and Hackett fine art auction: Sydney 28 August 2013 , 'Arthur Streeton', pg. 74-75, Melbourne, Aug 2013, 74. David Thomas, Deutscher and Hackett Fine art auction: Melbourne Wednesday 31 August 2011 , Catalogue entry for Lot 11 Arthur Streeton 'Panoramic view of Sydney Harbour, across Cremorne', pg. 32-33, Woollahra, Aug 2011, 32. Vivienne Webb, Australian art: in the Art Gallery of New South Wales , 'Golden age', pg. 37-38, Sydney, 2000, 18, 37 (colour illus. ), 38, 50 (colour illus. ), 302. Christopher Wray, Arthur Streeton: painter of light , 'City of laughing loveliness', pg. 72-84, Milton, 1993, 78. Australian magazine , 'Impressionism in Art', Sydney, Aug 1899, 347. Daily telegraph , Sydney, 27 Sep 1895, 6. The Sydney Morning Herald , Sydney, 27 Sep 1895, 2. Trustees of the Art Gallery of New South Wales: Minutes 1.9.1891-4.5.1898 , Sydney, 1891-1898, 25 September 1895, 28 October 1895, 6 August 1896. Art of Australia. Vol 1: Exploration to Federation , ‘Individual and national feeling’, pg. 545-610, Sydney, 2008, 576, 577 (colour illus. ), 579. A catalogue of Australian oil paintings in the National Art Gallery of New South Wales 1875-1952 , Sydney, 1953, 201. The Sydney Morning Herald , Sydney, 21 Oct 1895, 3. I blame Duchamp: my life's adventures in art , 'John Bull and the Little Boy at Manly', pg. 321-333, Sydney, 2009, 328. Ecological pioneers: a social history of Australian ecological thought and action , 'Seeing the land in a new light: people and landscapes in Australian art', pg. 34-71, Cambridge, 2001, 50. Wynne centenary 1897-1997: a selection of past winners from the Gallery's collection , Sydney, 1997. The Art Gallery of New South Wales Bulletin , 'The Art of Arthur Streeton', pg. 20-23, Sydney, Aug 1996-Oct 1996, 22 (colour illus.). Stampede of the Lower Gods: Classical Mythology in Australian Art , Sydney, Sep 1989, 9. Australian arcady: Landscape paintings from the Art Gallery of New South Wales collection , Sydney, 1983, (colour illus.). cat.no. 9 Note no pagination. Australian painters of the heidelberg school , Melbourne, 1979. The art of Australia , 'The Heidelberg school 1885-96', pg. 53-73, Melbourne, 1970, 63. The advertiser , Adelaide, 08 Nov 1944, 4. Argus , Melbourne, 05 Sep 1944, 6. The Sydney Morning Herald , Sydney, 26 Jan 1938, 9. Fifty years of Australian art 1879-1929 , New South Wales, 1929, 15 (colour illus.). Herald , Melbourne, 12 Sep 1924, 6. Daily telegraph , Sydney, 22 Nov 1921, 9. Lone hand , Sydney, 01 Jul 1907, 307.